We are active in the production and distribution of a wide range of Casing Pipes in the international market. We used the excellent raw materials like stainless steel and PVC for the manufacturing of casing pipes. We are also extending our services in the threading of screen and casing pipes. The casing pipes that we supply are accessible in different sizes, length, and specifications as per the requirements. Apart from that, we are one of the prominent Steel Casing Pipes Exporters and PVC Casing Pipes Suppliers in India. 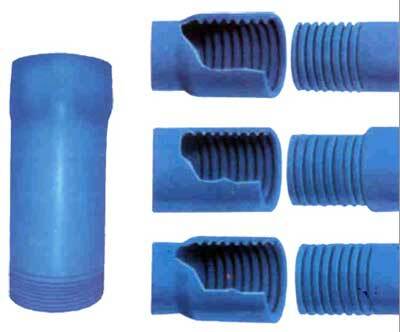 Lowering of the uPVC Ribbed Screens and Plain Casing is similar to that of mild steel pipes. However care must be taken to ensure that the pipes are perfectly upright which would ensure trouble free working of the tubewell. The pipes should not be driven using external force such as hammering etc. Use back wash method while gravel packing the well. Avoid generating excessive external pressure while gravel packing. The external pressure should be equalized. Exercise care during removal of drilling muds during jetting and surging not to create excessive differential pressure across casings. © Copyright 2009 - 2010. Ajay Industrial Corporation Ltd.